Before you commit to a training program, you need to measure body fat percentage to set a benchmark for your goals. How can formulate a plan for losing fat if you don’t know how much fat you want to lose? That doesn’t make any sense. Fortunately, there are several options out there to measure your body fat! You want to get the most accurate body fat percentage measurement that you can possibly get, but not all options are available to all people. I get that. Even if your benchmark is off—maybe even by as much as 20%—you can still use that measurement to track your progress. That is key. The starting line is just as important as the finish line. Maybe even more important. Finishing a bulking phase. Time to cut. You might have a mental block against getting your body fat measured. I can relate to that. It’s awkward to have a stranger pinching your fat rolls in the middle of the gym, especially if that trainer is a super fit model with the body of your dreams. It can be hard to face the truth about where you’re in this process. It was always hard for me to accept the things I need to change. I resisted measuring my body fat for decades, even in moments I was really trying to lose weight. I was afraid of the truth. The important thing to remember is that this is just the beginning of your process, and you need to know where you’re starting from in order to know how to get to where you want to be. This is true for ANY fitness level. Even if you are healthy and just trying to get to that “next level” fitness, you can’t know how to plan for that if you don’t know how far away from it you really are. It wasn’t until a few years ago that I finally faced my demons in order to make the changes I decided to make. I had to see the numbers to figure out what I was doing wrong. You already know that the number one muscle you need to train in order to get fit is your brain. (The brain is not a muscle, I know. It’s a metaphor.) You need to accept the flaws you want to change in order to change them. Measuring your body fat percentage is the most important part of that. So… how do you measure body fat? You’ve seen these. They look like a pair of spring loaded tongs, and they are used to pinch the skin on various parts of your body to measure body fat in different areas. In my experience, most trainers have a pair of these and use them with clients at the gym because they are easy and quick. The idea is that the thicker the skin fold is, the more fat you have in that area. A sample of various body parts is used to create an estimate of your total body fat percentage. causes an inherent level of inaccuracy. You also need to be very consistent each time you measure, because the person performing this test is, essentially, the machine doing the calculations. If you opt for this method, make sure you have the same person doing these measurements, in the same places, each time you track you progress. Additionally, fat calipers measure subcutaneous fat, but not visceral fat. Visceral fat is the deep tissue fat surrounding your organs, and it is the fat that will kill you. You may guess your visceral fat based on the amount of subcutaneous fat you carry, but this is highly inaccurate. If your family has a history of heart disease, I highly recommend a composition measurement that gives you a better picture of your overall health. 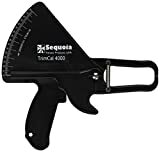 Still, if you feel like you are relatively healthy and just looking to lose those “last ten t0 20 pounds,” using fat calipers gives you a benchmark to begin with and can be a useful tool in tracking your progress. Plus, you can’t beat the convenience. Provides a number to start from! This is a body fat measurement technique that’s gained popularity steadily over the past few years, mostly because the technology can be packaged into consumer friendly, portable devices like scales and those hand grip things you see people holding mid-air. With this technique, an electric current is passed through the body to create a round-trip circuit. The speed of the current from point-A to point-B is used to assess the amount of fat you are carrying. Much of your body is made of water, which conducts electricity easily. But fat in mostly non-conductive, and slows the current down. Get it? The slower current—the longer it takes to pass through your body—the more fat you are carrying. Additionally, these don’t give you an accurate picture of visceral fat. goes down with consistent repeated measurements. There is always a benefit to repeating measurements, even inaccurate ones, because you will still be able to see measure progress once you have a benchmark. The convenience factor here is also pretty great. I use a scale at home that incorporates bioelectrical impedance analysis. Although the measurement is much lower than the more accurate methods I use, I can still track progress everyday, right in the comfort of my home, by comparing the daily measurements the scale gives me against each other. You can’t beat the convenience of stepping onto a scale when you get out of bed, and convenience can be a great tool for consistency. Above is a link to the scale I use currently, in case you are interested. I weigh myself every morning after I brush my teeth, to get a consistent reading. The scale is connected to my WIFI network, so the progress over time shows up in the apps I use to track weight, steps, workouts, etc. (More on that later.) It couldn’t be easier to get a steady set of data on my progress over time. The Bod-Pod uses air displacement to measure body fat by detecting the overall ratio of lean mass to fat mass. You sit in a sealed, egg-shaped chamber (the “pod,” duh) and body composition is determined by measuring the relationship between volume, pressure and mass. The Bod Pod is a newer, more portable take on water displacement body composition tests, using air. It’s obviously easier to port a person-sized, pressurized chamber than it is to port a swimming pool. I tried a Bod Pod at a crossfit gym three years ago when I was first starting my weightless process. I used the machine at the beginning of a 1-month “food & fitness” challenge, and then again at the end of the challenge. While it did accurately measure body fat and give me a wholistic picture of my ratio of lean mass to fat mass… that’s pretty much it. Looking back at the way I’ve measured body fat for the past few years, I have a better understanding of what was missing from this test’s data, and why I prefer other methods. Like body fat calipers or BIA machines, the Bod Pod can’t tell you how fat is distributed in your body. You don’t know how much visceral fat you are carrying, and it doesn’t ascertain the ratio of gynoid to android fat. At least with calipers you have different numbers from different points on your body (the various spots where you’ve been pinched), which gives you a rough idea of how your body distributes fat, or “trouble spots.” You still don’t know how much fat you have lurking beneath the surface, but at least calipers provide a better idea of the distribution of subcutaneous fat. Bod Pod results give a single set of numbers—lean mass, fat mass and estimated bone density—which might be enough, but not for me. Despite it’s shortcomings and potential expense, the Bod Pod is an accurate means of measuring your overall body composition, and can provide a great starting point from which to track your progress. Shortly after my brief stint in a crossfit gym—a few months after I tried the Bod Pod—I discovered the DXA scan. DXA (or DEXA) stands for Dual-Energy X-Ray Absorptiometry. The DXA scan was invented to test bone density2, mostly as a means of checking for osteoporosis without the need for full X-rays (at least that’s my understanding). At some point the value of the DXA scan as a general health and wellness tool became obvious, and commercial applications were introduced to the public. Now it seems like they are popping up everywhere, and the fitness community can’t get enough of it. What used to be a machine that was only available in hospitals can now be found on a bus that will come to your gym to perform tests for clients in the parking lot! It’s rad. What’s a DXA scan like? The first time I tried one of these it was parked near a gym on Sunset Blvd. I stood in the parking lot in my socks, waiting for my turn to use the machine. Once I stepped in the bus, I was asked to lay face-up on a table and to stay still for 7 minutes. It was surprisingly easy and comfortable… much more comfortable than the Bod Pod. As I lay there, a giant wand passed slowly over my body, taking small cross section X-rays of my body. The result is INCREDIBLE. I was provided with 6 pages of very detailed data about my body composition, including a visual outline of my body that showed where fat had accumulated. I knew exactly how much fat I was carrying and where I was carrying it. Additionally, I knew how much muscle I had—by weight!—in different parts of my body. “Like, holy sh#t, my left leg has 1.5 lbs more muscle than my right leg!” Time to hit the left quad a little harder. You also get information about your bone density, which is important to know as you age. (Bone density increases with strength training, btw.) This info is helpful for women especially, because low bone density may be an early sign of osteoporosis, and a cause for taking calcium or other supplements early. I can’t say enough positive things about this test. Latest DXA scan results. Click to view details. It feels so great to see these numbers. A DXA scan is the best way to measure body fat and so much more! Additionally, the report goes into lots of detail about where the fat is located inside the body. For instance, I’ve been able to watch my visceral fat mass drop from .45 lbs to .13 lbs. This might seem like a small change, but it’s HUGE when we are talking about the very dangerous fat around my organs. IT FEELS GREAT TO KNOW THIS INFO. Sure, but how much does a DXA scan cost? If you live elsewhere, Google DXA scan or DEXA scan and hopefully there is one near you. Knowledge is power. Knowing how much fat you have to lose (and, of possible, where it’s located) is information you need to arm yourself with before you start any fitness plan. You can’t set goals without knowing where you are starting from. For this reason, you should measure your body fat FIRST, before you calculate that deficit. I use a combination of DXA scans (twice a year) and a daily BIA scale measurement to track my fat loss progress. If you are serious about changing your body—and I bet you are, because you just made it to the end of another 2500 word blog post—you should invest in a tool (or tools) to measure body fat now so you can track your losses over time. Nothing feels better than charting these numbers and knowing that the small changes you make every day are adding up.